Your everyday Mac and Cheese just got an easy makeover with this Tomato Basil Mac and Cheese recipe. You can get it done in 20 mins, your kids will love it and everyone is happy! If you read Cooking Curries regularly or follow me on my social media – Face Book or Instagram (insta stories), you probably already know that I am huge advocate of letting your kids help out in the kitchen. I am a strong believer that, making them interact with the food they eat, makes them understand it better. Food no longer is a strange thing, vegetables are familiar and once they see that’s what is going in their breakfast, lunch or dinner, they are more likely to try new things and eat familiar things better. Along with letting them help out in the kitchen, it is equally important to take them along shopping whether it is to your neighborhood grocery store or the local farmer’s market. V loves to go grocery shopping with me. 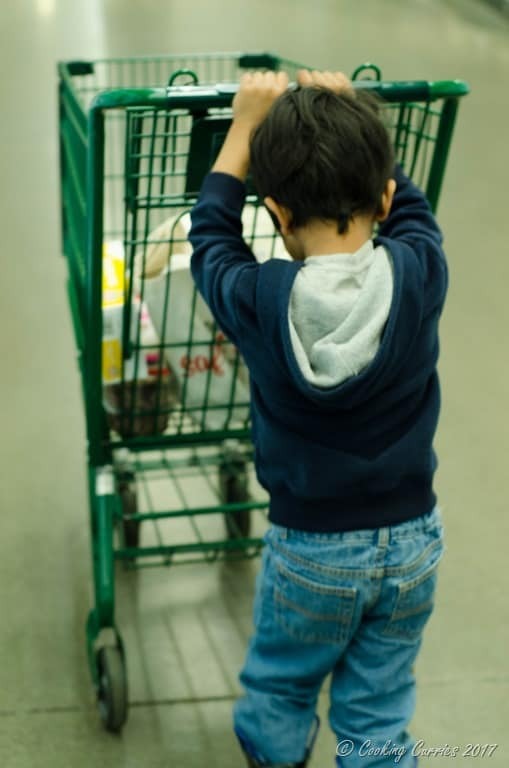 Not only does he like to “help” by pushing the cart around and helping unload the cart when we get to the cashier, he has now started to help with things to buy. He knows his snacks – crackers and cheese and chips and what not. He is also learning to look at vegetables and ask if we can buy some of his favorites and helps pick them out. 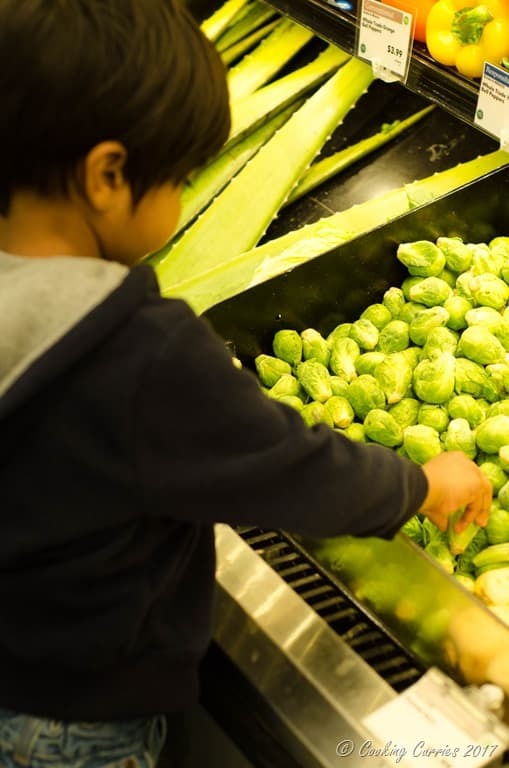 Just like these Brussels Sprouts he helped pick out. He has been asking me for the last two days, if I made Brussels Sprouts for dinner, as he helped pick them out! A huge highlight of our shopping trips, if it is to Whole Foods or PCC, is the hot food bar and salad bar. V loves to get an assortment of food and he actually loves them. Last week, when we went to Whole Foods, he wanted to eat Mac and Cheese, one of his all time favorites. We picked up some Mac and Cheese and some veggies from the salad bar – shredded carrots, beets (because he wanted to make his Mac and Cheese turn pink), some Broccoli (they are his favorite) and some green peas. I was pretty impressed by looking at his little bowl of food. As always, I talk to him about what we are buying and what I plan to make with them. When he took those grated beets to turn the Mac and Cheese pink, I thought why not make that a trend and pick up some things to make a home made Mac and Cheese a little colorful. I had some tomatoes in the cart and I knew I wanted to make some Tomato Basil Mac and Cheese for him. But buying herbs is always a tricky thing, especially if it is to use just a little bit of it, as I almost always never end up using the rest of it and all they see after that is the insides of my compost bin. That is when this handy little Dorot Frozen Chopped Basil came in handy. I am not much for pre-packaged things in general but I make exception for frozen vegetables. Especially when it is so nifty and handy as pre-chopped basil cubes! I mean, isn’t that just brilliant! They also have Crushed Garlic, Crushed Ginger, Chopped Cilantro and many more herbs! All these are taken at their prime freshness and flash frozen into trays of tiny cubes, within just 90 minutes of harvesting them. Yes, 90 minutes! That’s how fresh your Dorot Chopped Basil or Dorot Chopped Parsley is. And you can easily find them in the freezer aisle of your grocery store. We found this at our local Whole Foods Market. 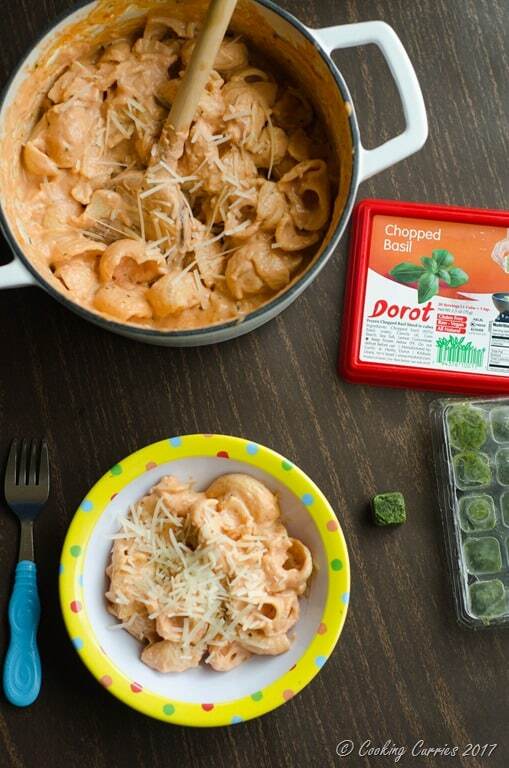 They are freshly frozen and retain all the flavors but that’s not the only great things about Dorot. They are packed as these little cubes, so you can just use one, two or as many or as less as you want without having to defrost the whole box of herbs. You can just easily pop out as many cubes as you want and put them directly in the pan – there is no peeling, no chopping, no wasting anything! Also, it made making this Tomato Basil Mac and Cheese super easy, that I was done in about 20 minutes from start to finish. My only regret is I discovered these magic cubes a little sooner! Bonus : The kiddo loved it!!! So, don’t wait till I did. Go get them right now and make your dinner prep that much more easier! 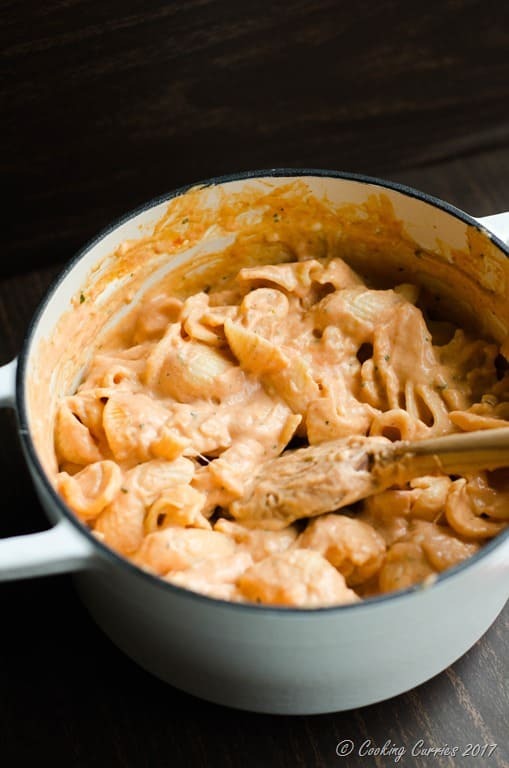 And don’t forget to try this Tomato Basil Mac and Cheese. Cook pasta in salted boiling water, like you normally do. Drain and keep aside. Heat the butter in a pan and add the flour to it, whisk well to avoid clumping. Cook for a minute or so, till the flour is no longer raw. Add one cube of Dorot Chopped Basil, give it a mix and add the pureed tomato. Mix well till the tomato is incorporated into the roux base of flour and butter. Add the pasta, salt and half and half. Once the pot starts steaming, add the cheeses and mix well till the cheese melts. Add the other cube of Dorot Chopped Basil and remove from heat. Serve immediately. I love the idea of frozen basil. Whenever I buy fresh (it’s so expensive in the winter), some always seems to rot before I use it up. This is a great idea. This looks amazing. 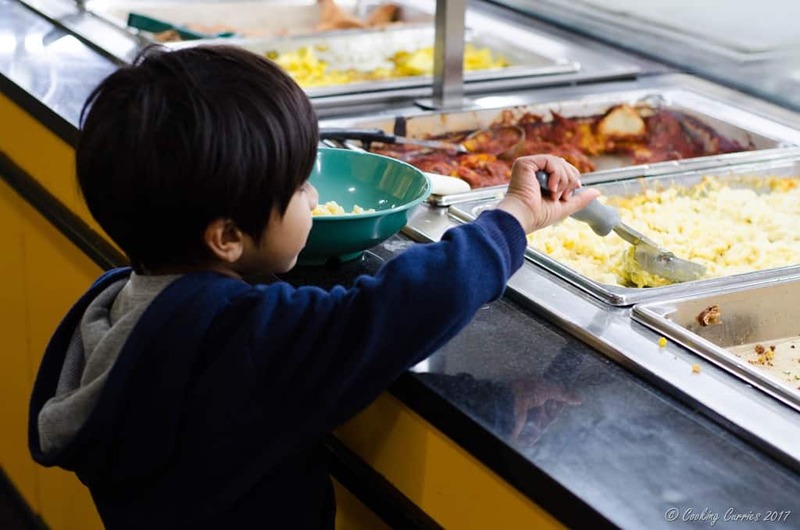 Love the pics of your little guy choosing favorites from the hot bar! Looks creamy and delicious. I love to try these frozen basil. That’s so cute that he likes to add beets to make his mac and cheese pink! Whatever helps them eat healthy food, right? 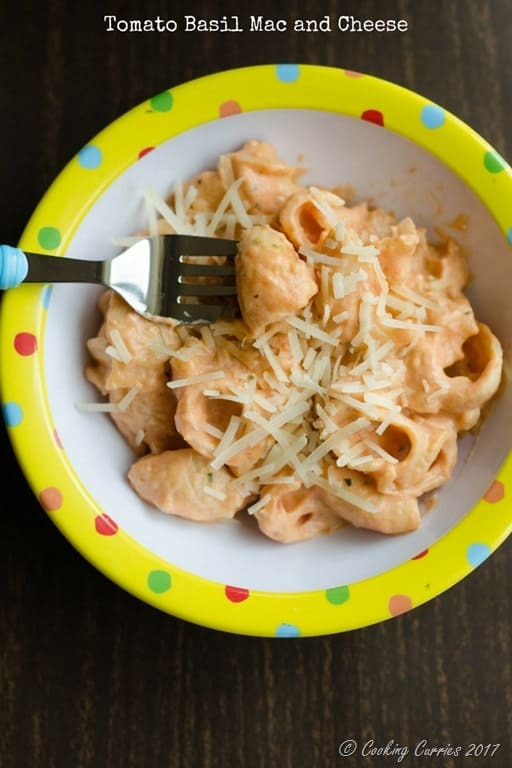 My son would love this mac and cheese recipe. I need to buy that frozen basil. Seems perfect to have on hand. Yes it is the best!! Thank you Melissa!